For the current date, you can print route slips for all patients with appointments in all operatories or a specified operatory, and you can print a route slip for an individual patient. 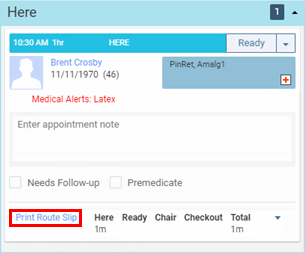 Also, you can print route slips for patients with appointments scheduled on your location's next business day. The Patient Routing panel is available at all times while you are logged in to Dentrix Ascend. To open the panel, click (or tap) anywhere on the thin, vertical bar on the left side of your browser window. Note: If you select a specific operatory, only the route slips for appointments in that operatory will be printed. To print today's route slips, click (or tap) Print Today. This button is available only if there are appointments scheduled today. 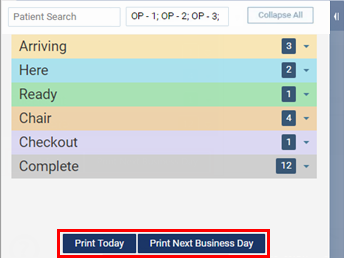 To print the route slips for the next day (relative to today) with appointments, click (or tap) Print Next Business Day. 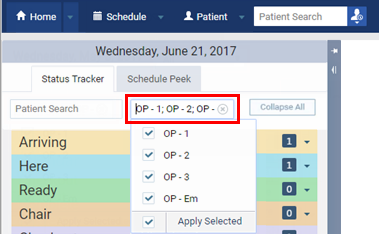 To print a route slip for one patient with an appointment today, click (or tap) the section header that corresponds to the patient's current status to expand that section, and then click the Print Route Slip link for the patient. The route slips appear on a new browser tab as a .pdf file so that you can save or print it. How do you print a routing slip for a single patient? How do I print route slips for a future date? What information populates under FYI field on printed route slip?